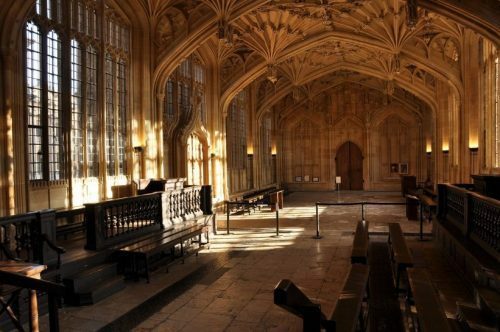 Bodleian Library – Divinity School: The gothic vaulted ceiling of the Divinity School was used as Hogwarts Infirmary in Harry Potter and The Philosopher’s Stone. Can you imagine the hospital beds lined up along the walls with young Harry lying in bed after his first big confrontation with Voldemort? But there are many more similarities between Oxford and Hogwarts to explore; did you, for example, notice the many grotesques along the walls of the college buildings, and their resemblance to the statues Professor McGonagall awakes to defend Hogwarts? 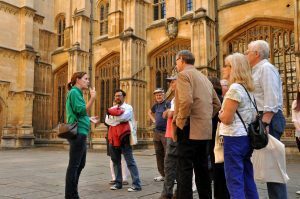 So, if you want to discover more interesting facts and secret stories about Harry Potter in Oxford, join a Harry Potter Walking Tour. Or prepare for your first day in Hogwarts, and visit our Visitor Information Centre, the ‘Diagon Alley’ of Oxford, where you can buy your personal wand or your very own Hedwig.